Evie loves books. When we say, "Evie, do you want to read a book?" She gives an excited yell in response. Every night, Daddy reads 3 books to Evie, and she pays attention. Evie's all-time favorite book is Brown Bear, Brown Bear by Eric Carle. Thank goodness somehow we got 2 copies of this book. One in each room that Evie hangs out in. Our developmental therapist suggested that we make a book with pictures of important family members so that she could learn their names. I thought about making my own and laminating the pages, or buying a ready-made board book and pasting pictures onto the pages, but I didn't like the thought that Evie could rip apart my hard work with little effort, or that the pages might be too flimsy for her to turn. So I found a company that does this, called Pint Size Productions. They make board books with digital photos, so the result is a picture book of the quality that Evie is used to looking at. Evie is currently being well-versed on the faces of her grandparents, uncles, aunts, godparents, and nanny. 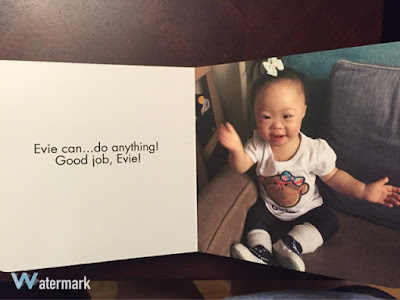 My second book is called "Evie Can Do It!" It runs through how Evie can...clap, eat, drink (shameless plug to show her drinking is cool), bathe, ride a horse, read a book, etc. I wrote it this way so that Evie would clap along. 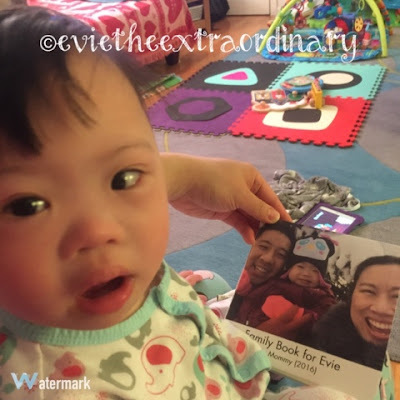 Its no secret that Evie likes looking at herself in the mirror, so it makes sense that she would look at a book about herself! 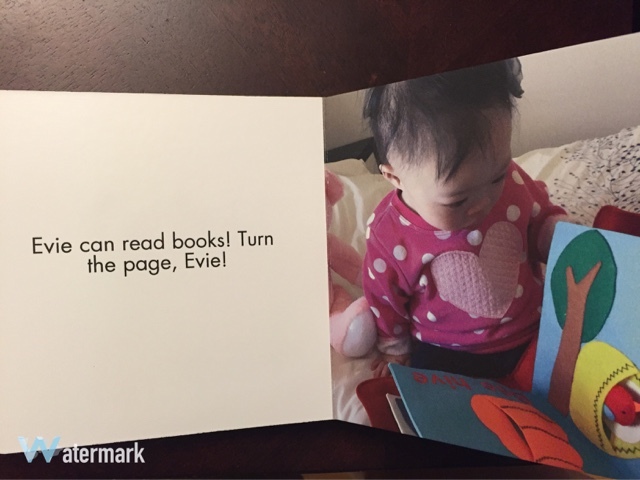 When we get to the end, Evie claps for herself. Every time we say "Good job, Evie," she knows she did a good job and starts clapping! I wrote to the company Pint Size Productions to ask if they would provide a promo code so I could tell them about their board books, and they delivered! Go to this site: www.pintsizeproductions.com and use the promo code PINTSIZETHANKYOU16. I just tried to add the promo code above at check out on a custom board book and it says the promotion code does not apply. Does it only apply to certain books? I am creating a custom book. I think the promo code probably expired...it was good back in June, so it's been awhile. It's worth e-mailing Pint Size Production's customer service to see if they will still honor that code from a blog post. So glad you are trying the book!